My husband Christopher and I recently braved a 100-degree June heat wave in Memphis for two reasons: to visit Rhodes College, his alma mater (where, despite the heat, we were compelled to stroll the stunning campus). And…to eat. 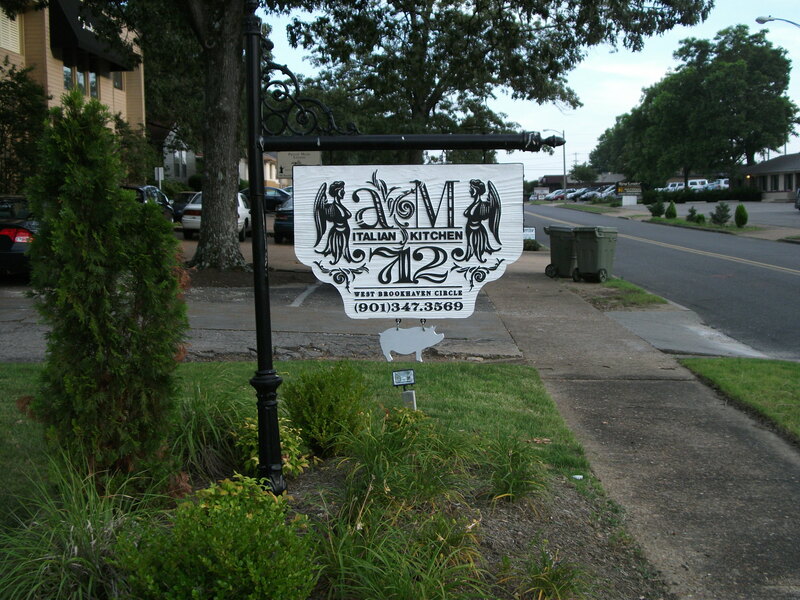 One of our most memorable meals was at Andrew Michael Italian Kitchen, a gem of a “green” restaurant in East Memphis, where chain restaurants largely prevail. Andrew Ticer, 32, and Michael Hudman, 31, lifelong friends, both native Memphians of Italian descent (second generation) and the chef-owners of their eponymous eatery, are two young rising star chefs in Memphis. Click here for my recent Food Republic “Chef Talk” interview with Andy and Michael, where they tell all…. Back to our evening at A/M… We nearly passed our destination—a seemingly non-descript beigy ranch house with brown trim. The sign, however, assured us we were at the right place. And inside? Oh, what cool relief! Burnished wood floors. Bare wood tables with votive candles and fresh-cut purple hydrangeas. Mullioned doors that looked onto a lovely courtyard patio. In true Italian style, the restaurant is a family affair. And not just because Andy married Michael’s cousin this spring! The rustic chic dining room, inviting and warm, was the handiwork of interior designers Karen Spinosa and Sarah Spinosa—Andy’s cousins. The vibrant artwork adorning the walls? All by artist Rena Chiozza, Michael’s aunt, who also helps tend the chefs’ garden every morning. And only one person makes the sacred gravy for the restaurant’s signature Maw Maw’s ravioli: Michael’s father. The food? Fresh. Local. Market-driven. Simply Italian—with a pork-friendly Memphis spin. 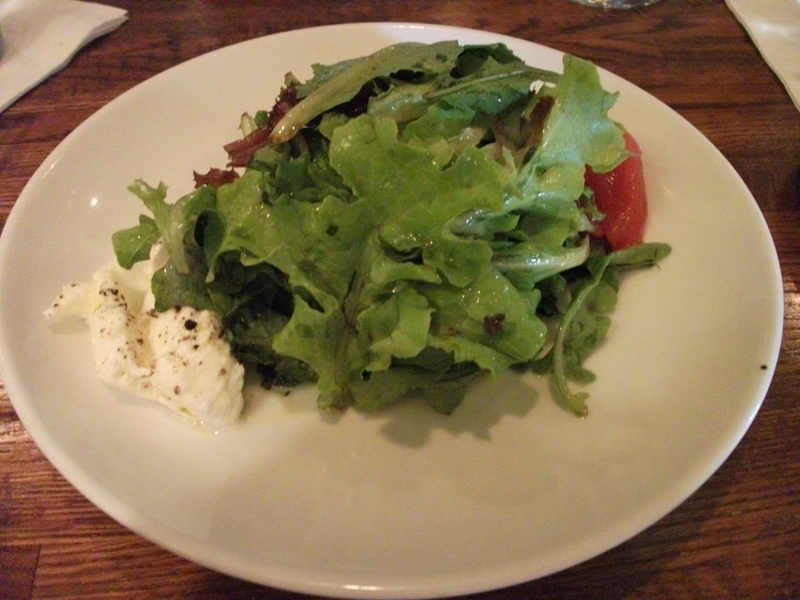 My husband started with an “A/M Salad” ($7, left), showcasing freshly plucked greens in a balsamic-shallot vinaigrette, olive oil-drizzled buffalo mozzarella and tomato confit. But I had to get their signature can’t-take-off-the-menu dish: “A/M Breakfast” ($9, right). 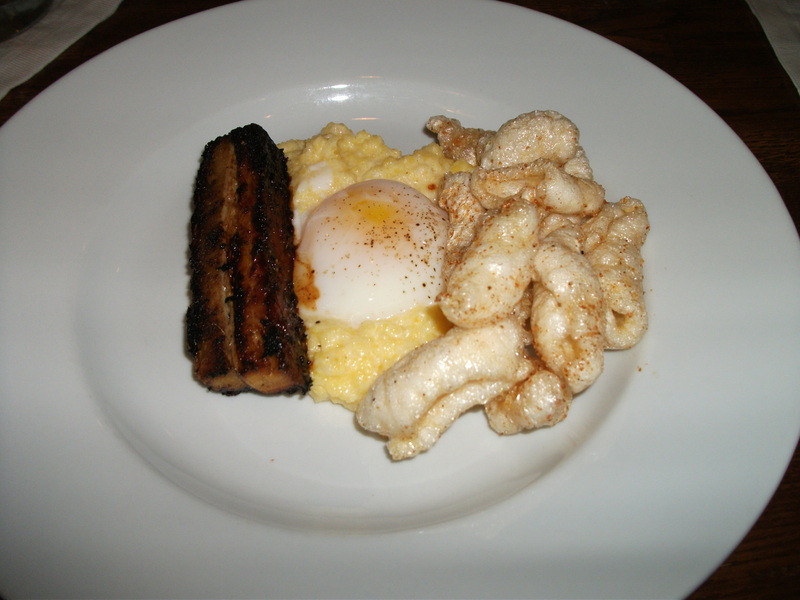 It’s an inimitable ode to pork, Memphis-style, featuring a 63˚ poached egg over creamy polenta, pork belly, and ethereally light pork rinds. I have always had an aversion to boiled eggs, poached eggs and fried eggs (it’s the texture and the sulfuric smell that, for me, is an instant turn-off). But Andy and Michael’s 63˚ degree sous vide poached egg was so delicate (without a whiff of sulfur) that I actually ate it! A notable first. Ironically, shortly after I returned from Memphis, Michael and Andy arrived in New York to cook at the James Beard House on June 11th. 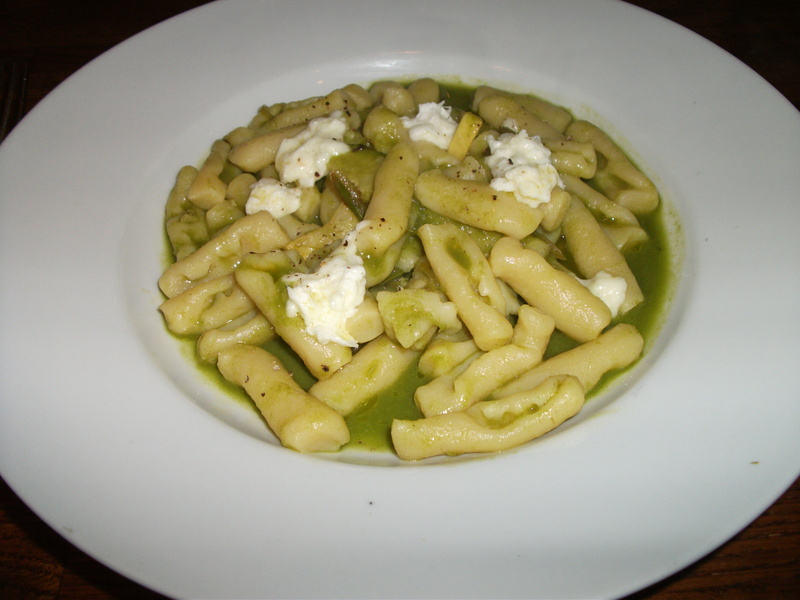 This entry was posted in Restaurants, Travel and tagged Andrew Michael Italian Kitchen, local food, Memphis, Memphis green dining, Memphis Italian restaurant. Bookmark the permalink.